StarVault Cloud Backup Pro is a versatile backup application that allows customers to back up databases, applications and virtual machines to local and offsite destinations, e.g. local hard disk, on-premises backup appliance, and managed online backup server located in datacenter. With such flexibility, we are able to offer on-premises, online, or hybrid backup solutions for your customers based on their own requirements. StarVault Cloud Backup is an advanced disk-to-disk-to-disk (D2D2D) backup that comes with the most comprehensive features that can fulfill all the on-premises backup, online backup, offsite backup, and cloud backup needs of nowadays businesses. StarVault Cloud Backup consists of 2 core software components: StarVault Cloud Backup Pro and StarVault Cloud Backup Start are the backup software for installing on the servers, desktops or laptop computers that you need to back up. 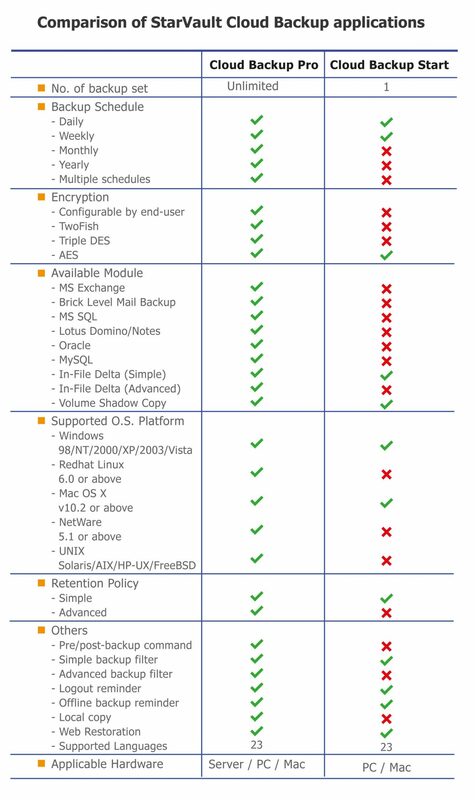 StarVault Cloud Backup supports the following add-on backup modules to back up different type of servers. Except Microsoft Exchange Individual Mailbox, VMware and Hyper-V backup modules, all other modules will be included in the Purchase and Meter license of StarVault Cloud Backup.